With Amber’s help 15-year-old Joshua now has a full-sized trumpet, takes trumpet lessons and is learning Braille music. He is going from strength-to-strength with his trumpet-playing, passing his grade 3 music exam with distinction, despite his busy schedule and on-going eye problems. As well as his music, Joshua acts and has played the part of a blind child in the BBC’s Silent Witness series. Music is an escape for Joshua as he often has very intense days coping with the demands of a busy mainstream secondary school. He especially looks forward to his trumpet lessons and loves to play. It helps him to remain confident as, now that he is older, it is becoming more obvious to him that he is different to his sighted peers and cannot always access the same activities as they do. Music is one of the few things he can not only participate in on a par with his friends, but also excel at. With the right support, music allows Joshua to perform, compete and relax. 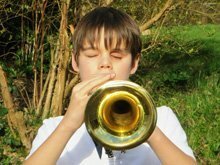 He gets a great sense of achievement from his trumpet playing and it is also teaches him how to organise himself and understand the importance of devoting time to practising each day.